Well, as a post-holiday gift to you, I’ll tell you the secret. Shhh… lean in. Are you leaning in? Really? Okay, so in order to make really good pork crackling, you need to get the pork as dry as possible. In short, that is why my husband went all Ken Paves on our pork. We got some other tips here and used a little poetic license as far as the heat and timing was concerned. But that is how we ended up with the crispiest pork rind west of the English Channel. Posted on 5, January 2012, in Food and tagged food, hair dryer, pork, pork crackling, pork rind. Bookmark the permalink. 2 Comments. So now I know and will certainly give it a try! I am an Irishman married to a Brit. With three women in the house I would have no chance of getting my hands on a hairdryer. Sorry to break up the crackling party. I have the distinction of having cooked roast pork for our family dinner one evening last year. The result was three broken teeth on my crackling. One of my 53 year old molars, one of my 81 year old mothers and one of my 22 year old daughters front teeth (only a minor chip but….). Now that’s crispy crackling! 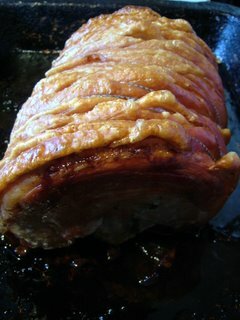 Have a look at http://conorbofin.com/2011/12/02/who-the-hell-is-lord-paddington/ for another great crackling focussed dish.